One of the best and worst parts about writing a weekly book blog is the amount of books that I own. Each year, I get countless requests from authors and publishers asking me to read and review their books. Being the bibliophile that I am, I also can't help but enter into book giveaways. Who doesn't like a free book!? The only problem is that several of the books I win or receive for potential review end up lingering on my ever-growing "to be read"(TBR) list. There's simply not enough time to get to every book! One of those unlucky books happens to be Lie to Me by J.T. Ellison. I won a copy last fall from one of my must-read book blogs, A Bookworm's World. In an attempt to put a larger dent in my TBR list, I decided to begin my year by reading it. Publishers love to proclaim that their book is "The next Gone Girl." Usually this ends up being nothing more than a cheap marketing ploy. I've yet to read one of these novels that has even the slightest similarity to Gone Girl. A thriller by a female author is not enough basis for an adequate comparison. When I saw the blurb at the top of the cover from author Lisa Scottoline declaring, "Fans of GONE GIRL will gobble up this thriller about a marriage from hell," I feared the worst. 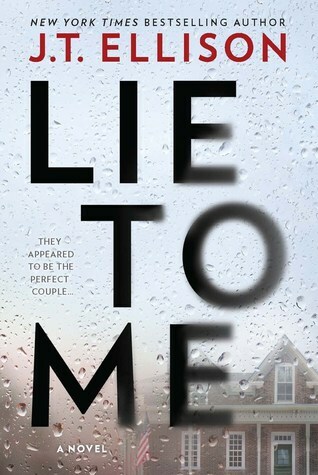 To my surprise, Lie to Me truly does warrant comparisons to Gillian Flynn's best-selling novel. Ethan and Sutton Montclair are a married pair of authors living in Tennessee. Ethan writes critically and commercially acclaimed literary fiction while Sutton focuses more on historical romances. Like Gone Girl, the novel opens with the wife missing. Sutton has left a note telling Ethan that she has left and that he shouldn't try to find her. Oddly, she has left her wallet, phone, and computer behind. Ethan knows their marriage has been on the rocks since the unexpected death of their infant son, but he still fears for Sutton's safety. He also knows that in the case of a missing wife, the husband is also the number one suspect. The first half of Lie to Me is told entirely from Ethan's perspective. Flashbacks of his marriage as well as present day dealings with Sutton's disappearance give the novel an ever-building suspense. My only problem is that neither Sutton or Ethan is particularly likable. They are equally complicit in their toxic relationship. Even when the novel shifts to Sutton's perspective in the second half and we gain a clearer idea of how the events have unfolded, I still didn't care for them. Thankfully, author J.T. Ellison includes Holly, the lead investigator on the case. Holly is a young officer who has her eyes set on advancing through the field to get a government office job. The next step on that journey would be getting the title of detective. If she can complete the Montclair investigation without any hiccups, she just might receive that title. Holly gives the story a character that readers can latch onto and root for. Without her, the novel would simply be too dark and distant. Lie to Me works quite well as a domestic drama. Ellison relishes in her deliciously deceitful characters and allows their drama to unfold at the perfect pace. The first half of the book maintains wonderful suspense and keeps the pages turning. When the novel shifts to Sutton's point of view, the book loses a bit of the tension that made the first half so enthralling. By that point, however, I was already invested enough in the story that I had to see it through. While I was a bit disappointed in the ending (the story just ballooned too far out of plausibility for me), I was happy to have made Lie to Me my first read of 2018. It is the first book I've read that justifies any comparison to Gone Girl, so I have no qualm in saying that fans of that book will enjoy this one. Go ahead and add it to your 2018 TBR list. You'll race through it in no time! This entry was posted on Thursday, January 4, 2018 and is filed under Book Review,Drama,Family,Gillian Flynn,Gone Girl,J.T. Ellison,Lie to Me,Thriller. You can follow any responses to this entry through the RSS 2.0. You can leave a response. Great review! I just recently added this one to my TBR. I was totally having the "so many books, so little time" panic attack yesterday. So much I want to read but life gets in the way! Sounds like this one is worth the read. It is always a tricky balance when you have so many books to read! Thanks for stopping in! This one is on my TBR list, and I think I might already have a copy (isn't it sad that I don't even know?!) There are just so many good books! I’ve definitely bought a copy of a book that I didn’t realize I already owned. So you’re not alone on that one! Yes, I agree the first half was stronger and you had to swallow the little blue pill with some of the twists. Still a worthy read though. Thanks for stopping in!